An Emerald Waterways river cruise combines comfort and innovation on-board our state-of-the-art Star-Ships. Our promise of Exceptional EmeraldVALUE ensures everything you need is included in the price, from flights, transfers and on-board tips, to every chef-prepared meal and complimentary drinks served with lunch and dinner. Insightful days ashore are brought to life by our tour guides on exclusive EmeraldPLUS excursions and EmeraldACTIVE activities, both taking our guests to the heart of history and culture. Alternatively, guests can head out and explore on their own using our free on-board bikes. As the sun sets, kick back and relax in spacious cabins. Each suite or stateroom boasts luxurious toiletries, a hotel-style bed, an HDTV with infotainment system, and Wi-Fi for connecting with friends back home. Add a pre or post cruise stay in one of Europe’s most loved cities during their annual Pride celebrations, such as Prague, Vienna, Amsterdam or Budapest, and you can see why a European river cruise is the perfect choice for your LGBT customers to explore Europe’s iconic rivers and cities. 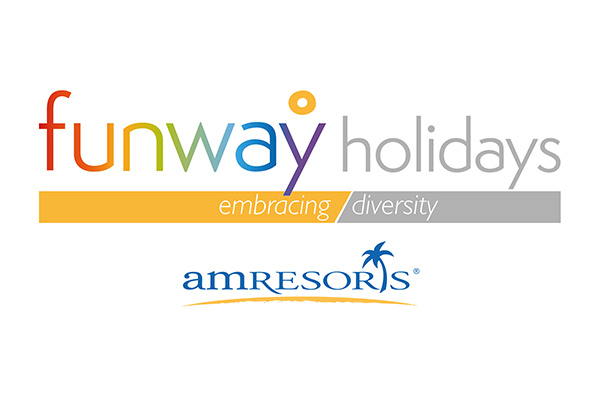 Funway Holidays & AMResorts are delighted to partner together to showcase a collection of over 50 luxurious resorts in Mexico & The Caribbean delivered through a leading tour operator, established for over 25 years. Funway Holidays boasts an array of benefits for our travel agent partners including exclusive offers, appealing incentives, regular FAM trips, competitions and a supply of marketing collateral including brochures. AMResorts offers an impressive 7 brands within its portfolio, each with a distinct personality. The portfolio spans Caribbean, Mexico & Central America to truly offer the pinnacle of All-Inclusive. What’s more, AMResorts & Funway Holidays can offer stunning wedding & honeymoon options with complimentary options and luxurious upgrades available. For further info call Funway Holidays on 020 8290 9754. Hoseasons is one of the UK’s leading self-catering accommodation specialists with over 28,000 places to stay in coastal and countryside settings throughout Britain and Europe. With the largest selection of luxury lodges with hot tubs, log cabins and boutique beach huts, alongside traditional holiday parks, country cottages and boating breaks on the Norfolk Broads and the UK Canal network, it’s easy to see why over 1.4 million holidaymakers and more than 73,000 pets holiday choose a short break or longer stay with Hoseasons. The Israel Government Tourist Office is proud to be a partner of the TTG LGBT. Our goal is simple: Promoting Israel as a holiday destination, both through the travel trade and directly to the consumer. We understand the importance of recognising excellence in the travel industry, and appreciate TTG for this incredible opportunity. Israel is enjoying an increase in UK visitor numbers, and the dedicated support from our partners in the travel industry is one of the reasons for growth. We appreciate and thank you for your valuable work. We’re also investing heavily in advertising. Our current campaign, “Two Cities – One Break: Tel Aviv & Jerusalem”, highlights the benefits of taking a city break to these iconic and cultural cities. This Autumn will showcase more of our “Two Cities” campaign, as well as a new campaign to promote the amazing opportunities the Red Sea resort of Eilat holds for your clients. Thomas Cook Group Airlines, part of Thomas Cook Group, is one of Europe’s leading airlines, consisting of three sun and beach focused leisure airlines: Thomas Cook Airlines UK, Thomas Cook Airlines Scandinavia and Condor in Germany. In spring 2018 the newly-founded sister airline, Thomas Cook Airlines Balearics will join the group in Palma de Majorca. The airlines carry 18.5m customers per year to more than 160 destinations. More than 9,000 employees in four countries work passionately every day to be the world’s most loved leisure airline and are proud to work for an LGBT friendly employer. In the UK, Thomas Cook Airlines is adding Dubrovnik in Croatia, Varna in Bulgaria, Funchal on the Portuguese island of Madeira and the beautiful city of Thessaloniki in Greece to its 2018 programme. In long haul, Seattle is joining a growing list of Manchester routes to the USA, underlining its commitment to Manchester Airport as the long-haul hub of the north. Thomas Cook Airlines UK is once again a proud headline sponsor of Manchester Pride’s “The Big Weekend” 2018. Thomas Cook Airlines embrace diversity in all its forms, from gender, race and religion to sexual orientation, disability and age. Embedding diversity into every corner of the business enriches the working environment for employees and allows the airlines to better anticipate the needs of customers. Inclusivity brings with it new perspectives, points of view and fresh ideas – all of which are key levers in inspiring success. With 950 Members, The Travel Network Group is the UK’s largest independent travel membership organisation providing a range of propositions, products and services that enable new and existing travel businesses to operate within the travel sector. Its key differentiator is the unique way in which it puts its members at the heart of its business through delivering market-leading help, guidance and support. In 2017, through its annual membership survey, undertaken in association with The Institute of Customer Service, the Group achieved a score of 83.9% rating the company as providing a world-class service to its Members. The Travel Network Group is delighted to be a key sponsor of TTG’s LGBT initiative. As a team we share an enormous passion for what we do and together strive to create an open working environment that provides equal opportunities for everyone to flourish, and the freedom and support for individuals to be their true selves at work.